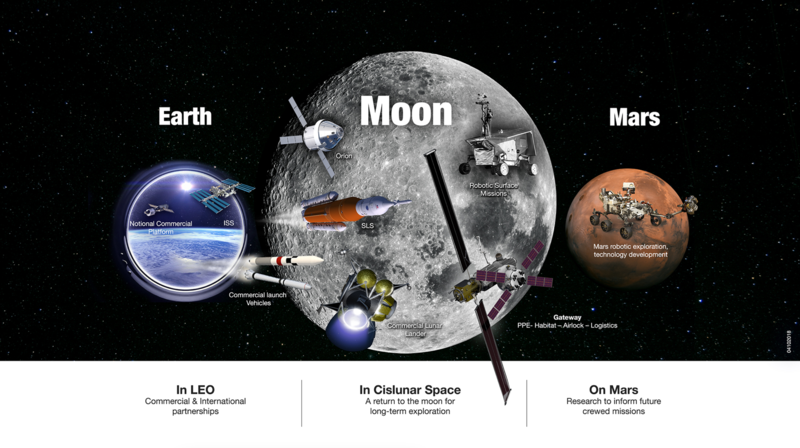 NASA’s Exploration Campaign includes active leadership in low-Earth orbit, in orbit around the Moon and on its surface, and at destinations far beyond, including Mars. In answer to that bold call, and consistent with the NASA Transition Authorization Act of 2017, NASA recently submitted to Congress a plan to revitalize and add direction to NASA’s enduring purpose. The National Space Exploration Campaign calls for human and robotic exploration missions to expand the frontiers of human experience and scientific discovery of the natural phenomena of Earth, other worlds and the cosmos. The Exploration Campaign builds on 18 continuous years of Americans and our international partners living and working together on the International Space Station. It leverages advances in the commercial space sector, robotics and other technologies, and accelerates in the next few years with the launch of NASA’s Orion spacecraft and Space Launch System (SLS) rocket. Transition U.S. human spaceflight activities in low-Earth orbit to commercial operations that support NASA and the needs of an emerging private sector market. Lead the emplacement of capabilities that support lunar surface operations and facilitate missions beyond cislunar space. Foster scientific discovery and characterization of lunar resources through a series of robotic missions. Return U.S. astronauts to the surface of the Moon for a sustained campaign of exploration and use. Demonstrate the capabilities required for human missions to Mars and other destinations.